Prendo is a UK-based provider of project simulations which are developed with input from industry and client experts, and with advice from professors at the world’s leading business schools. This content expertise is combined with Prendo’s unique simulation authoring system and ability to model technical, financial and, in particular, human variables. This capability has evolved since 1998 when Prendo was commissioned by Shell to develop a simulation of how their typical spectrum of stakeholders behave during a sensitive project. Since then, Prendo, its clients and its partners have run hundreds of simulation workshops. The feedback from thousands of managers across a wide range of both private and public sector organisations has been used to further refine the simulations, optimising the learning experiences and adjusting the subtle balance in the simulations between realism, complexity and usability. Prendo’s simulations are much more than simplistic “quizzes” or “e-reading” exercises, but are more comparable to flight simulators – i.e. they are highly realistic virtual environments that model the dynamic variables of the situations and thus allow managers to ‘live’ the challenges and practise the corresponding skills. Act Knowledge has been delivering Prendo simulations in Australia since 2011. Prendo’s Managing Project Teams simulation gives participants a dynamic experience of controlling project execution in the safety of a simulated environment. Even for experienced project leaders, achieving project objectives consistently on-time and on-budget remains a difficult and sometimes elusive goal. Structuring effective control procedures for the muddle, ambiguity and stress of complex projects is essential to successful delivery. To improve their control of projects, the people using the simulation develop their capabilities in the following areas: Managing project success; Managing risks and uncertainty; Establishing appropriate control over the project; Managing the project sponsor; and Using communication effectively. Participants need to structure and use control procedures and actions during the implementation of the project, while dealing with the uncertainties and risks in the time, cost and quality of delivery of the project’s tasks. They have at their disposal the tools of project management, such as GANTT charts, EV graphs and risk logs. They must decide how to interpret this information on an on-going basis, how to use it for making adjustments as the project progresses, and how to communicate the appropriate information effectively with project team members and sponsors. 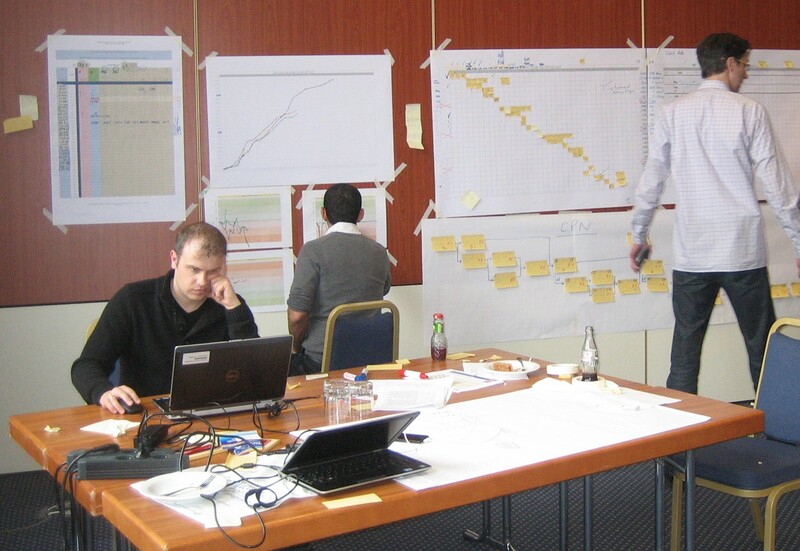 The simulation was developed originally for a project management training and consulting firm. Prendo’s Project Leadership simulation allows participants, organised in competing teams, to manage a complex project from initiation through to operation. It gives teams a chance to experience how their decisions in all the key project management disciplines combine to determine the final outcomes. The simulation was developed after conducting a thorough survey of the most common causes of project failure and it requires teams to make judgements in several key areas including: clarifying and keeping focus on objectives (e.g. commercial outcomes), scope definition and changes, contract and procurement strategy, resourcing, scheduling, risk and stakeholder management. Crucially, the simulation brings to life the importance of integrating these disciplines. The simulation was developed in collaboration with the Major Projects Association, with expert input from across the MPA’s network of contacts, in particular Dr Martin Barnes FREng CBE. Prendo’s Project Control simulation gives participating teams an opportunity to practise using a range of project management tools and techniques, including: risk and stakeholder analysis, work breakdown structures, logical flow and critical path analysis, bar charts, budgeting, cashflow, resource allocation and also Earned Value analysis. The simulation challenges teams to use the techniques simultaneously and it gives them a chance to experience the difficult trade-offs and the “juggling” act that project managers usually face. Prendo’s Leading Change simulation gives participating teams a chance to “live” the challenges of managing an organisational change initiative. The simulation is based on a comprehensive model of how and why human beings react to change: i.e. a range of commercial, personal, emotional and ‘political’ factors. The simulation is also used in Merger Integration and Strategy Implementation contexts. Based around a scenario of planning the integration of two organisations after a merger, the simulation challenges teams to decide a series of integration options (e.g. staff reduction and IT systems) that have different cost saving and revenue growth implications. Teams also have to manage the human reactions to the change, and it is the careful balance of these business and human (hard and soft) factors which determines the final success of the initiative. The simulation was developed in conjunction with Maurizio Zollo (now of SDA Bocconi) when he was an Associate Professor at INSEAD. Prendo’s Managing Stakeholders simulation is derived from a simulation that was originally commissioned by Shell. The simulation has been used across many industries and also by numerous public sector organisations. It brings to life the universal leadership challenge of gaining buy-in and approval across a range of interested parties that are likely to have different and often conflicting interests. This capability is increasingly regarded as the key factor that determines the success of initiatives.